The Bushnell Trophy Camera is equipped with 8 MP high-quality full-color resolution and 720P high-definition video resolution. This device produces high-quality images that you need for the research. It can record videos with audio for the most vivid viewing experience you may get. It is detected by a passive infrared motion sensor and is triggered by movement. You will never miss even the most unimportant footage of the area with the trigger speed of 0.6 seconds. It has an auto-passive infrared sensor that allows you to maximize consistency. The auto-PIR motion sensor can also monitor ambient temperature conditions and regulates the trigger signal automatically. This camera is designed for any outdoor activities as it offers water and snow resistant feature. This camera has 32 LEDs that serves as a flash and allows the camera to take pictures in total darkness with a detection range of 60 feet. This trail camera is set to operate during the day and nighttime as it is armed with day and night auto sensor. It offers a time-lapse mode that enables you to take pictures at set intervals to record the changes that take place slowly over time. This time-lapse mode will automatically take photos and record video clips at your choice of intervals. The time-lapse is more useful during dusk and dawn. Another feature that the Bushnell Trophy Trail Camera offers is the field scan 2x allows you to set-up two windows of image capture. The images captured by this camera are automatically stamped moon phase, time, date, temperature, and GPS geotagging. The GPS geotagging allows you input the longitude and latitude of the camera’s position. This feature is useful for the users who use more than one camera in the area. You can set it up for any outdoor activities, and it is durable with the water resistant feature offered. The wide detection range can monitor the entire yard of the house and gives you security in your whole property. The camera’s set-up is straightforward and easy to understand. The software of the camera works well as well as the field scan 2x feature. It has a great picture and videos and sensors. It is small and compact that you can carry it anywhere. The exterior is camouflage to prevent the thieves from recognizing it. The battery life is superior and lightweight with a compact AA batteries. It is easy to install, easy to open and close. The IR flash narrows the circle that enables it to catch the whole wildlife area. The nighttime quality pictures are sometimes grainy, washed out, and highly pixelated. Sometimes, daytime pictures are not as clear as you expected. The pictures captured may be poorly flared anywhere towards the sun. The set-up is in the middle position; the on and off switch has a poor design because the set-up goes first before the switches. You cannot delete a picture or a video directly on the camera; you still need to download it to the computer to empty the SD card. 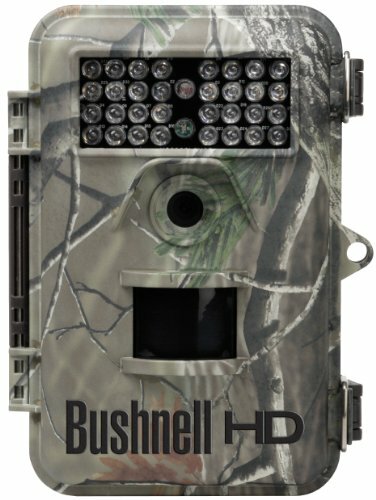 Bushnell Trophy Trail Camera HD offers audio to the recorded videos with a display of black and white LCD. It is a weatherproof device with a temperature range of -5 degrees Fahrenheit to 140 degrees Fahrenheit. The ample storage offered by this device is 32GB SD memory card. This camera has a product dimension of 7.2 x 9.8 x 2.6 inches and a shipping weight of 15.2 ounces. It has an adjustable web belt and 1/4 to 20 socket SD memory card slot. It can be used for sports, fitness, hunting, fishing, and trail monitoring. Bushnell Trophy Camera is a little bit costly as it gives you a high-definition quality of images and videos. Every penny is worth the spent with the features offered by the camera. It could provide you the satisfaction and expectation you desire in spending. The cost of this camera compliments to the value you may get from it. With all the features and benefits that this camera offered, its value is worth your every penny. From the high-definition quality, flash and detection range, motion sensors, night-vision mode, and flexible operating settings, it sounds costly but all worthy. The cost of the camera is two times the reliability you may experience in using it. The best customer of this trail camera is the one that aims a perfect day and night shots. Everyone can be the best customer as it is not only suitable for wildlife hunting but also for home security surveillance. Researchers, wildlife hunters, and filmers that needs high-definition quality photos and videos for their projects are the ones suitable for this. It can be used for any indoor and outdoor activities. Whether you need a hunting camera or a security camera in your house, this device would be a good choice. Bushnell Trophy Trail Camera HD is highly recommended for the researchers and hunters who are searching even in all season of the year. The customers who need convenience would also appreciate this types of the trail camera. It is a helpful device for everyone in any profession. If you are looking for a mid-price trail camera, Bushnell Trophy Trail Camera HD is recommended for you. It has a feature of fast trigger speed and recovery time, high-resolution video and high-quality pictures, the detection circuit, all of them make this camera stand out. This device is loaded with technology as it is a product of Bushnell Cameras. The interfaces, video audio, time-lapse and other modes, and the nighttime blur-free images are just a few of the best features it offers. This camera is valuable, reliable, and durable. It also gives convenience to the users. This camera product from Bushnell will provide you with high-value and exceptional performance in the field.